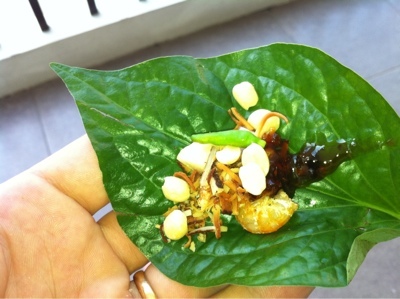 I found another Miang vendor in Banglamphu today and for 35 Baht I purchased a neat little pack containing betel leaves, chopped ginger and shallots, dried shrimp, toasted shredded coconut, lime, peanuts, a sweet chilli jam and of course a few scuds. It was a bit more expensive than yesterday but it is a more tourist district so that is to be expected. We have had Miang back home and enjoyed it then but we are quickly developing an addiction. It is so refreshing and zesty, I will definitely be searching out betel leaves in Melbourne. Actually I'm pretty sure I've seen them for sale in Footscray. Did I mention they go perfectly with beer? I am also acquiring a taste for the whole scuds, especially in the Miang. This pack only contained about 5 which definitely isn't enough! 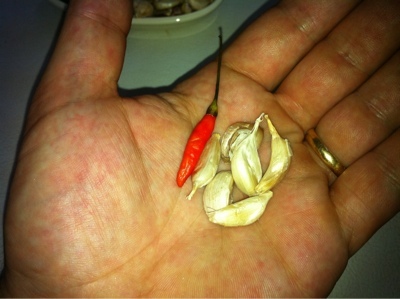 I also wanted to show a picture of some Thai garlic cloves. I've read that they are much more subtle in flavour than the western variety and having seen them they are certainly smaller and more delicate. Don't think I'll find these in Melbourne though.